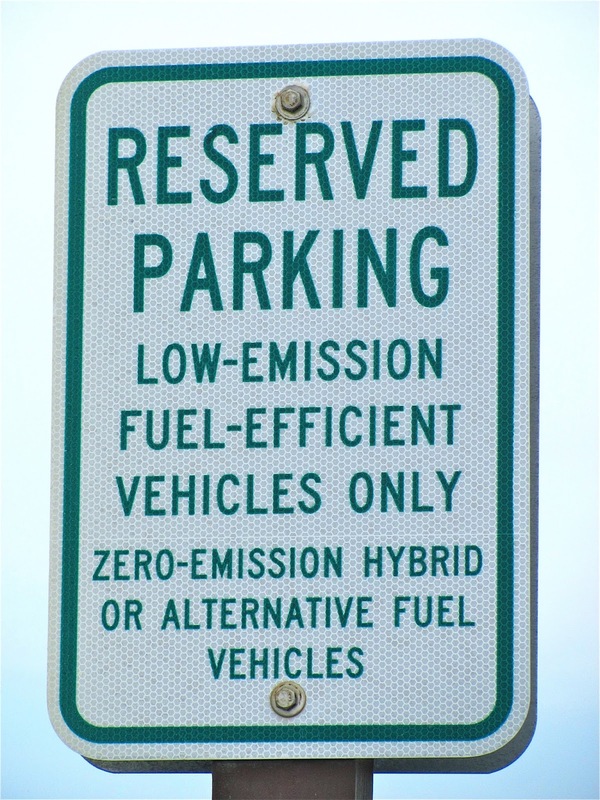 "Green" vehicles have a reserved parking space at the beach. There are 25 parking spaces in the east parking lot at Herring Cove Beach that are reserved for these "green" vehicles, very close to the snack bar, changing rooms and so forth, right near the edge of the beach. These are actually right next to the handicap spaces, which they outnumber two to one. That's right… This lot has 12 reserved spaces for cars with handicap plates, and 25 reserved for drivers who have gone green. Will this become a trend in all federally operated facilities? Will it help to motivate people to consider the environment when they purchase their next car? By the way, it takes over 39,000 gallons of water to manufacture a car, so speaking environmentally, you don't want to buy a new car very often. Also, some 1,851 gallons of water are used in refining a single gallon of crude oil. The tons of pollutants and chemicals put into our air by every conventional automobile on the road are not the only issues to consider when driving ourselves around the planet. I don't know whether green parking spaces should outnumber those reserved for people with disabilities, and perhaps they should. The National Park Service must have studied this idea carefully before launching it. 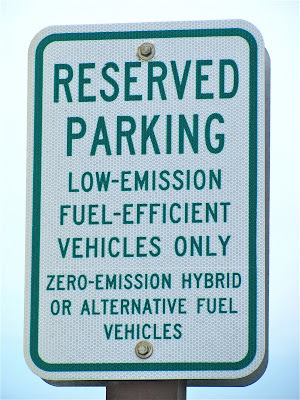 If this will help nudge more people toward adopting a greener way of life, I'm all for it. Now, if only the NPS would provide the electrical hook-up at these spots so that drivers of electric cars could charge up their vehicles while they're at the beach. You'd think a few solar panels added to the restroom rooftop would do the job. 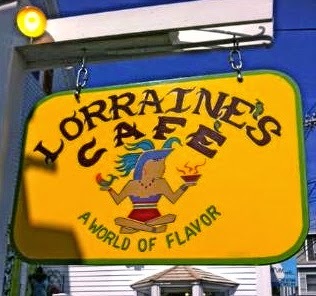 my favorite new Provincetown bar food this year. Devon's Bradford Street location, at the corner of Pleasant Street, is shape-shifting this summer. Its focus has turned to global bar foods, with flavors and influences from around the world in snacks, bites, small plates and bowls, ranging from $2 to $12, no kidding, and perfectly suited for sharing and tasting. There's a new bar, too, called On The Rocks, made from an old dory that Devon has spruced up, turning it into a sleek, comfortable bar featuring more than 30 thoughtfully selected wines from around the world (11 of them by the glass,) a variety of unique cocktails and half-a-dozen good New England beers. I'm working my way around the menu. 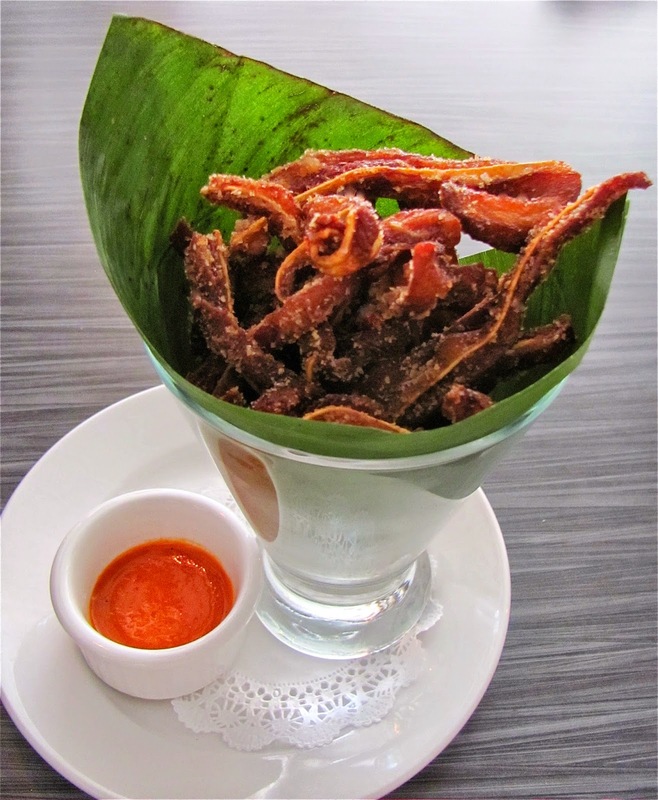 On my last visit I had to try the Julienned Fried Pig's Ears, a delicacy I had never had before that day, but I've had this perfect bar food on my mind ever since. These thinly sliced strips are deep fried, so they're crispy, yet somehow still tender, dashed with a bit of chipotle lime salt and served with a spicy pique puree dipping sauce: a just-right blend of chilies, pineapple, a little vinegar and a bit of garlic. blend of middle eastern spices - again, a perfect bar snack. 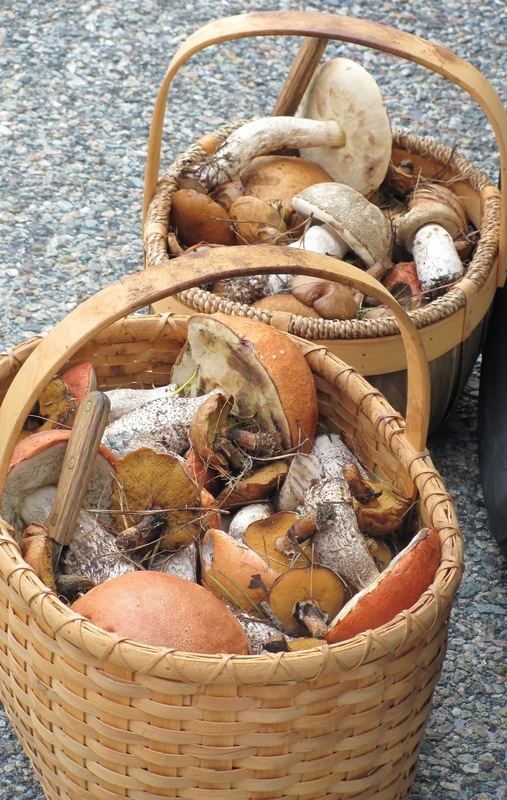 I couldn't stop munching on them, washing 'em down with a cold New England beer. I tried a good IPA White, still nice and hoppy but with a little lighter body than the darker IPA. I tried them both, and each also went well with the Fried Chickpeas with their Zatar Spice. That's a middle eastern blend of sesame, dried mint, oregano and sumac, sprinkled on chickpeas that have been fried up light and a little crispy. 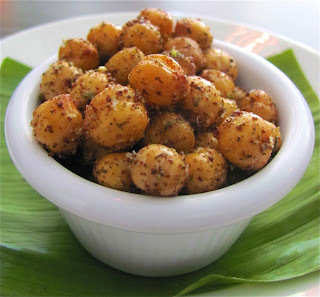 These make a great bar snack to munch on with a beer or a cocktail. The new bar is beautiful, by the way. A lot of Townies dropped in to try it out while I was there that evening. Stewed linguica is a great dish with a Portuguese influence. Chefs Melissa Ettinger and Lourdes "Uyi" Ortiz cook with ingredients from around the world, and take their inspiration from the cuisines of many regions. Asian specialties include real ramen noodles, made fresh, in-house. Bacalaítos are salt cod fritters that originated in Puerto Rico, now popular in the Dominican Republic and in other countries. Mexican street tacos are on the menu, one with meat and another is vegan, each wrapped in a fresh, house made corn tortilla shell. A new favorite dish of mine is stewed linguica with melted onions and figs, served with grilled peasant bread. Right now Devon's Food Bar is open Friday through Sunday for dinner, from 5:30 to 10 PM, at 31 Bradford Street. They have a random selection of 3 or 4 of their snacks and bites at half price during happy hour, currently Saturdays and Sundays from 4 to 6 PM, and they offer a great breakfast Friday through Monday from 8 AM to 1 PM. Those hours will change on June 15th, when breakfast and dinner will both be served daily, except Thursdays, when they'll be closed. Parking is available, too. Try this new bar, and a few items from Devon's new menu of global bar foods, and you'll be back for more of these wonderful flavors, and another trip around the world. Key Words: Bars, Breakfast, Casual Dining, Cocktails, Dinner, Ethnic Food, Restaurants With Parking, What's New? 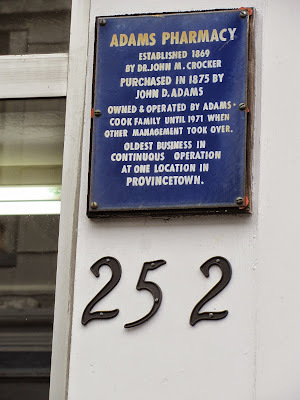 What will become of this plaque, since Adams has moved? After 146 years, as the oldest business operating in the same Provincetown location for all that time, the shop that will perhaps forever be known to Townies and frequent PTown visitors as Adams Pharmacy, finishes that legacy by moving across the street. 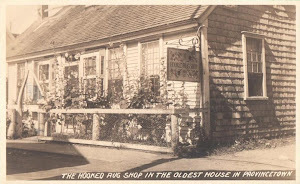 Known at various times as 252 and as 254 Commercial Street, the house at the corner of Commercial and Gosnold streets was built about 1850, with the small front yard giving way at some point to the storefront that was built on sometime later. 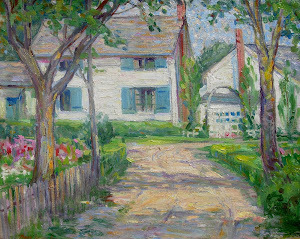 In 1869, Dr. John M. Crocker, who was the original publisher of The Provincetown Advocate, was living in the house when he started printing his weekly newspaper. It seems that the pharmacy business was started in the same year. Born and raised in Provincetown, Dr. Crocker had graduated from Harvard Medical School in 1866, and practiced medicine here for some 20 years. 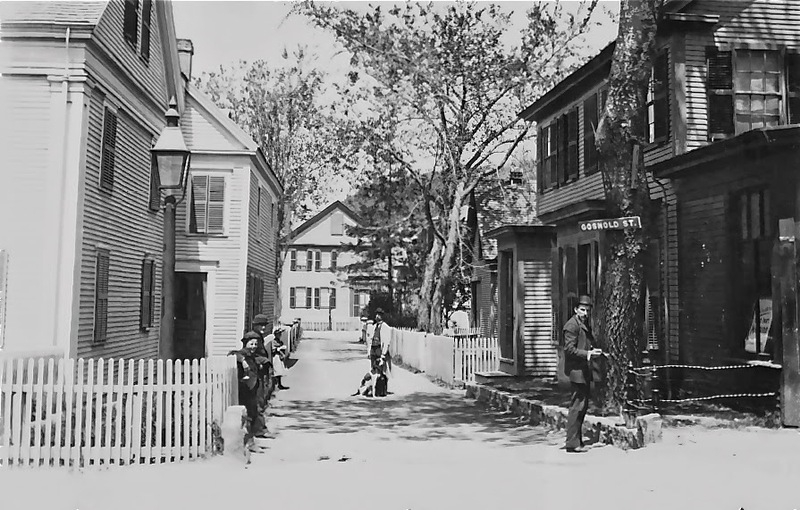 Adams' Pharmacy, at the right, about 1880. Gosnold Street sign is on the tree. John D. Adams lent his name to the business when he bought it in 1875. Later, relatives in the Norman Cook Family got involved with the business, followed by Norman Jr., who ran the place for over 40 years, beginning in the 1930s. He was a volunteer on the Provincetown Fire Department, as well as a licensed pharmacist. His wife Dorothy ran the store while her husband served briefly in the Pacific in WWII, having been drafted into the Navy. They eventually passed down the management of the shop to Joe Ward, whom they had more or less "adopted" when he had begun working at the store as a troubled teen, needing a home. 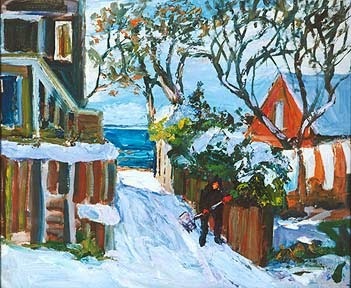 The town shovels out after a huge snowstorm in 1939. 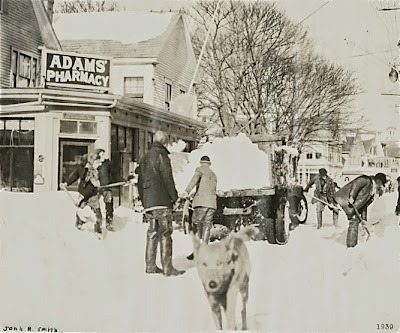 Adams Pharmacy has always been a sort of gathering place for PTown folks. After the second enlargement of the storefront there was plenty of space for three tables in the center of the room, where people could have a cup of tea while they discussed the events of the day or swapped stories and rumors. When a long counter with twirling stools and an old fashioned soda fountain was installed, the place instantly became a hangout for high school kids sipping sodas after class and on weekends, and by then most of the town was starting each day with a hot cup of coffee at that counter, along with a couple of juicy tidbits from a neighbor or two. probably taken in the 1950s. Notice the old ice cream chest. Vincent Duarte bought the property in 1989, and he continued to run the pharmacy. 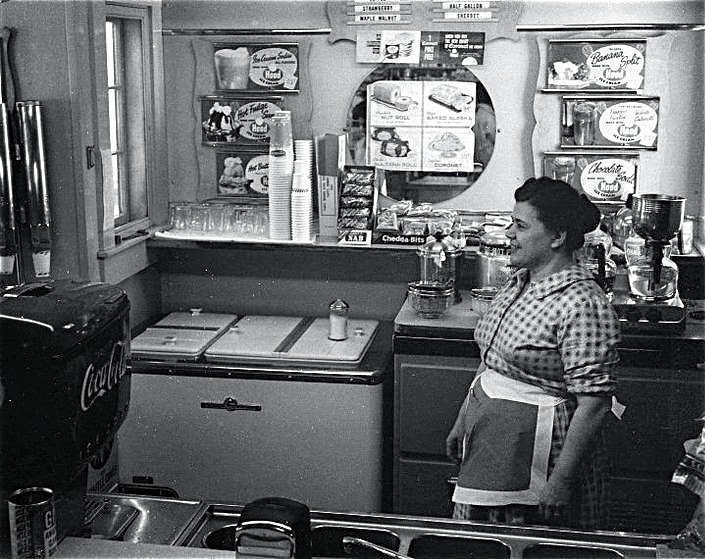 When he removed the beloved soda fountain and counter in 2003, the entire town seemed to go through a period of mourning. Tables and a few chairs were once again employed, and folks could still stop in for an ice cream treat from the self-serve freezer, or share a little gossip over a newspaper and a cup of coffee, but it just was never quite the same. 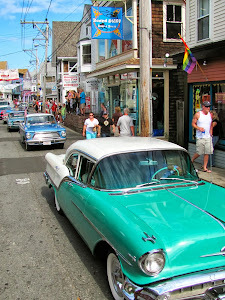 Although Duarte still owns the shop today, he sold the pharmacy interest in the business to Stop and Shop when they came to Provincetown in 2009. I'm afraid this week's move will really prove to be the end of an era as Adams moves across Gosnold Street, trading places with Big Vin's Liquors. who was likely exploring Cape Cod waters around the year 1004. 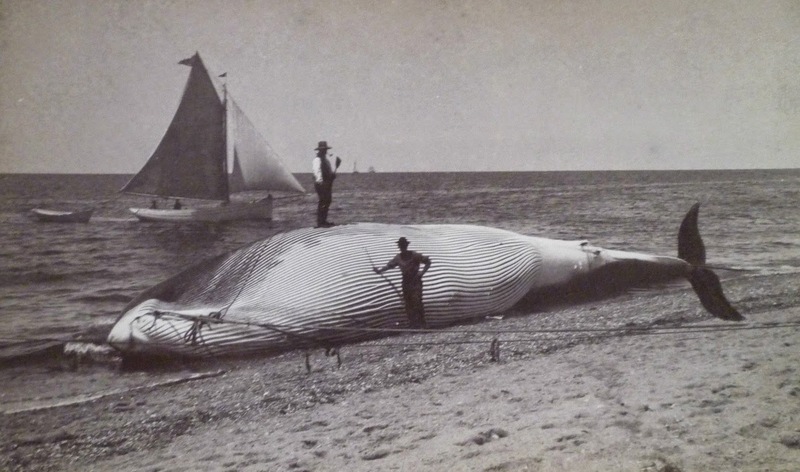 Explorers from foreign lands began sailing the waters surrounding Provincetown at least 1,000 years ago, giving the land we call Cape Cod today many names over the years. 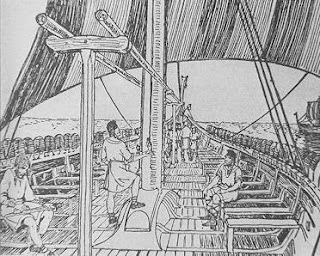 The Vikings were among the early adventurers in these waters, with Thorwald, the younger brother of Leif Ericsson, damaging the keel of his ship in a serious storm off the shoreline of what has been presumed by many to be Cape Cod, based on Thorwald's description of the land and the huge bay he found on that journey, around the year 1004. The Vikings didn’t begin to record their history in writing until about 200 years later, but stories of their adventures, passed down orally to later generations, included details of these voyages. 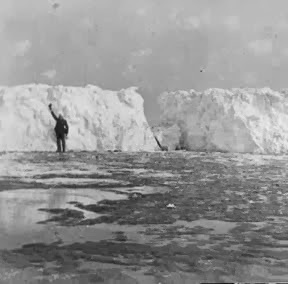 Historians presume that Thorwald’s ship struck a sandbar, whereupon he and his crew came ashore to make repairs, calling the land Keel Cape, named for the damage to his ship. Later, exploring nearer to the area we call Boston today, Thorwald and his men fell into a skirmish with a native tribe. As he lay dying from the wound of a poisoned arrow, Thorwald asked his men to return his body to the place where they had stopped to repair the ship, and to bury him there with a cross at his head and a cross at his feet, and to then call that land the Cape of Crosses. So Thorwald had twice changed the name of Cape Cod himself, and others also changed it over the years. 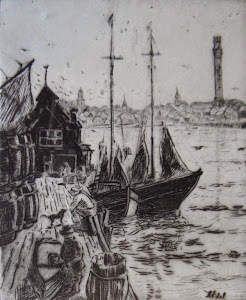 By 1475, the Basque fishermen had made several excursions on the Atlantic Ocean, reportedly to an island location they never disclosed, carrying back great shiploads of cod, and keeping their destination in the Atlantic a secret. 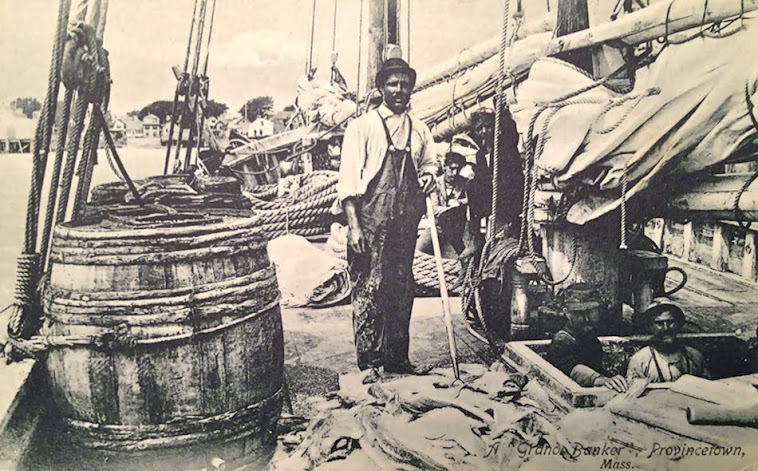 By the 1500s the Portuguese had discovered the tremendous stocks of cod and other fish to be found in these waters, and began sailing across the Atlantic to easily fill their boats with fish. In 1525, Portuguese explorer Estêvão Gomes had sailed this way under the Spanish flag, returning with a report on all the fish he had found near the land he had named Cabo de la Arenas. All of the early explorers mentioned those huge schools of fish. of the Smithsonian Natural History Museum. That leads us to Gosnold, who gave the Cape the name that would finally stick. Nascent British explorer Bartholomew Gosnold was born into a rather well to do family, and had studied law at Cambridge University, but at the same time he had become enchanted with the sea. On the 26th of March, 1602, sponsored by members of the British aristocracy, Gosnold took command of a small ship called the Concord, weighing anchor in the port of Falmouth, England, and setting out on a grand adventure seeking a new route between Europe and the “New World,” which we know today as the continent of North America. 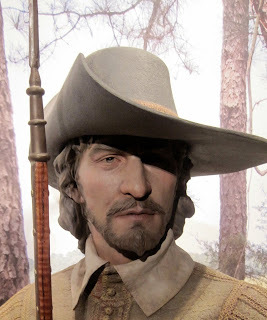 Rather than sailing along the established southern route through the Canary Islands and the West Indies, he was in search of a shorter route, a northwest passage, to Virginia. At that time the entire North American shoreline from Florida to Canada was called Virginia, named for Elizabeth II, the Virgin Queen of England, by Sir Walter Raleigh, who had introduced Gosnold to life on the high seas. Besides establishing a new, shorter route across the Atlantic, Gosnold was also on a mission to establish a British colony in northern Virginia, and had set a course to the west, running fairly straight across the ocean from England. Due to bad weather, an inadequate ship, a crew that was only fair at best, and perhaps his own uncertainty, Gosnold soon found himself in the Azores, far off course from the route he had planned. 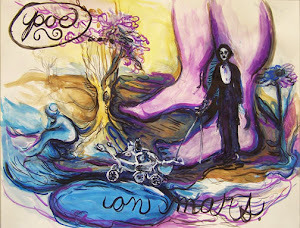 But that turned out to be a stroke of luck. Setting out once again for the New World, Gosnold sailed almost directly west from the Azores, and within a record breaking forty-nine days the ship and its 32 passengers came within sight of the rocky shoreline and beaches of Maine. 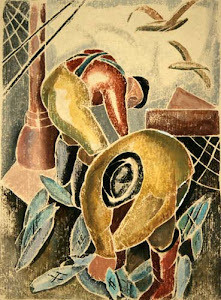 'Concord' by James W. Mayor, Jr. The Concord was a leaky, 39-foot, 30-ton Dartmouth bark carrying roughly 22 would-be settlers and a crew of perhaps ten men. 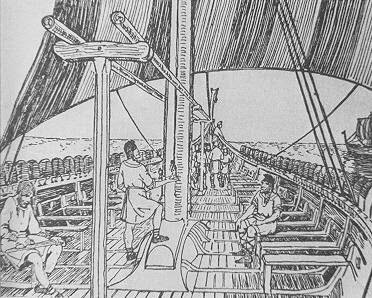 There are a number of accounts of this adventure, each written by a man who was on the voyage, but none could concur on all the details, though the majority agreed that the total of men onboard was thirty-two. 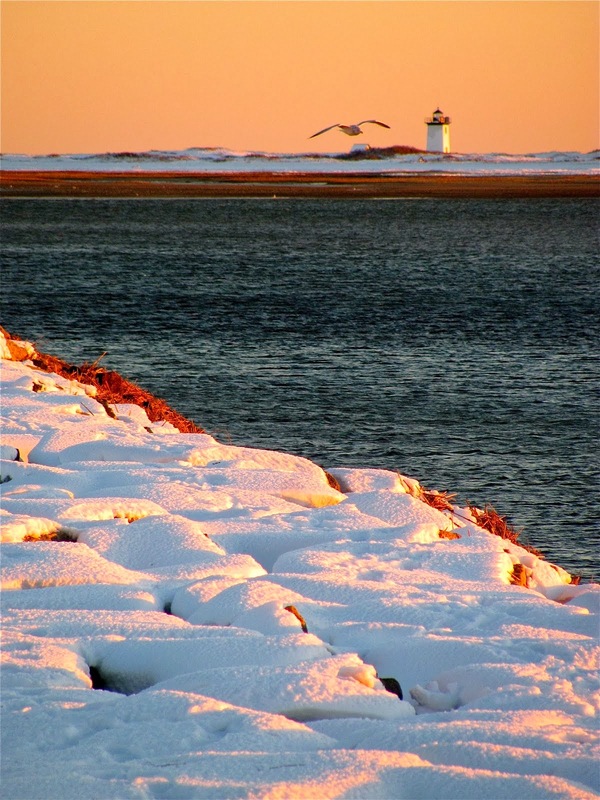 Upon arrival on this continent, they anchored overnight off the shoreline of Maine. 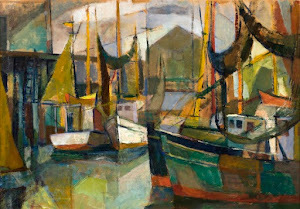 The following day they continued their journey, sailing southwest and following the coastline, staying some distance off the shore and measuring the depth of the unfamiliar waters as they traveled. They found a large, curling peninsula encircling a huge bay, the entire area teaming with cod, mackerel and herring, and Gosnold named the place Shoal Hope. Here, he and four other men went ashore in a small shallop, and are presumed to have been the first Englishmen to have set foot on this sandy hook of land. The name stuck as other explorers came this way, like Captain John Smith, who noted Cape Cod on his map in 1614, and the Pilgrims knew that they had found Cape Cod when they landed here, also through navigating errors, on November 11th, 1620. Next month I’ll bring you another chapter in the saga of Bartholomew Gosnold, who failed in his attempt to build an English settlement on a tiny island off the shores of the Cape on that trip, but that’s a story for another day. 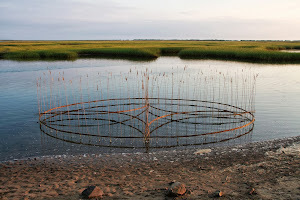 Today, let’s just celebrate May 15th, Cape Cod’s birthday (sort of,) when it finally got its name, 413 years ago today. of the moon rising over Provincetown Harbor. Wow! 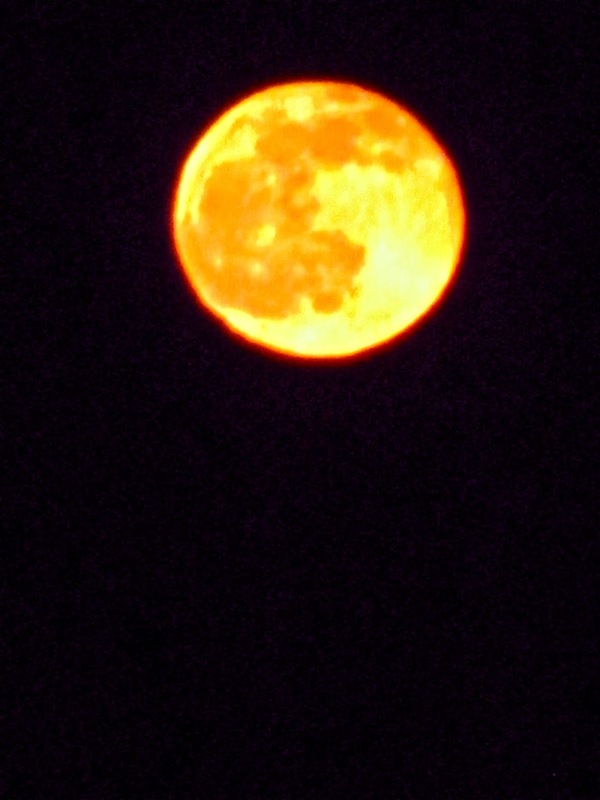 Did anybody see that full moon rising over Provincetown Harbor the other night? 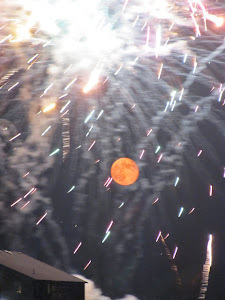 When the timing is just right, and the moon is full, it's a reddish, golden color as it begins to push up into the sky, just peeping above the horizon like the sun does at daybreak. As the moon rises it turns more of a yellowish color, gradually turning whiter as it rises in the night sky. This happens just a few times during the year, and is visible as long as the night is clear and humidity is low. So when the next full moon comes along, and is just rising shortly after sunset (unless you don't mind getting up at 3 AM or so to see it,) make your way to the edge of the harbor. The moon seems to rise about an hour later each night, and a day before or after the actual full moon will also give you a pretty spectacular sight, so choose a clear night where the rising moon will just peek up above the harbor, after dark, but before you are in bed. Any Town Landing will lead you down to the beach for a nice viewing point. The little neighborhood beach at the West End parking lot is my favorite spot to catch this amazing sight. Betsy's Friday fish & chips lunch special is a great PTown meal bargain. During the winter Bayside Betsy's, at 177 Commercial Street, has been offering not only their Friday night fish fry, but also a Friday lunch special, which will disappear in the middle of May. There are two more Fridays left, till May 15th, to get Betsy's Fish and Chips lunch for just $8.99. This lunch was among the best meal bargains I found in PTown last week, with a huge piece of haddock fried up in a crispy coating, served with fries, coleslaw, lemon, tartar sauce, and ketchup for your fries, and your choice of soft beverage. I had the iced tea. Get yours before it's gone. again. Those smiling faces are always there. Photo is from Far Land's website. Far Land Provisions, at 150 Bradford Street, also has at least one more Friday fish special, but I'm not sure how many more Fridays it will last. Go this week to be sure, and get your fried cod sandwich with a caper-basil tartar sauce, lettuce and tomato on a toasted bulkie roll. 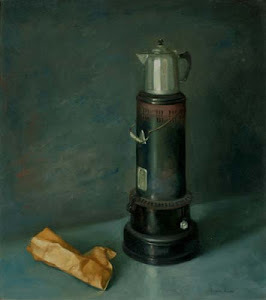 Click on farlandprovisions.com to find their website, and scroll down the page to find hot sandwiches they've been making over the winter. These. too, will likely disappear shortly as the season gets busier, which is already starting to happen, so now's the time to taste their black bean burger with a lime-cilantro aioli, or hot pastrami or turkey Reuben, or other hot choices. Once they become too busy to make 'em, we'll have to wait for winter to bring back Far Land's hot sandwiches. Enjoy them while you can. Bubbles' last lunchtime fish fry for 2015 is this Friday at the Governor Bradford. Governor Bradford Restaurant, at 317 Commercial Street, offers their wintertime hot lunch specials for just two more days. Today, Thursday, May 7th, they'll serve meatloaf with mashed potatoes and hot vegetables, and Friday, May 8th, will be the last day for Bubbles' lunchtime Fish Fry specials for the 2015 season. It's a generous serving of golden-fried fish served with coleslaw and a mountain of French fries, with lemon and tartar sauce. Each of these meals is just $7.50, with a soft drink included, which probably makes these lunches the best meal bargain in Provincetown this week. The accommodation bounces "down along" Commercial Street, toward the East End. 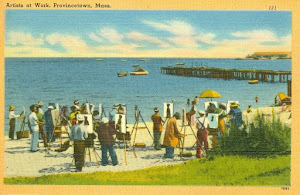 This postcard was published by The Advocate, printers of Provincetown's weekly newspaper under that name, as well as a great number of postcards offered in their storefront at 265 Commercial Street, across the road from Town Hall, known today as Waydowntown restaurant. The year is around 1910, when there weren't many vehicles on the road, and two-way traffic was still allowed on Commercial Street. This is the corner of Commercial and Standish streets, and in the background is the dark, gaping, angled doorway of the building now known as the Post Office Cafe and Cabaret. 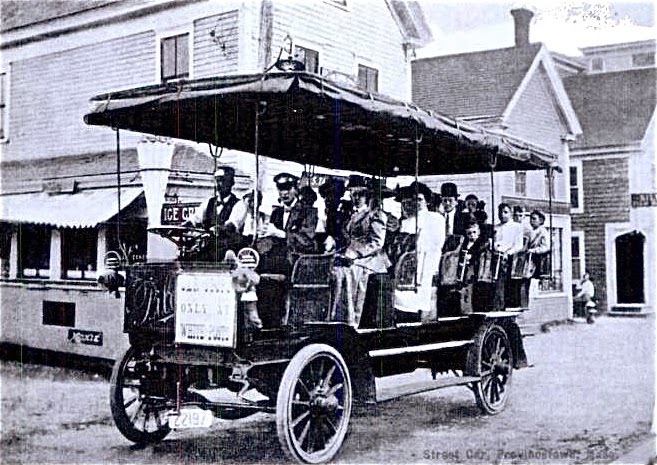 The early motorized bus in the photo was one of many over the years which served Provincetown residents by making trips to each end of Commercial Street, traveling both "up along" and "down along" many times daily. 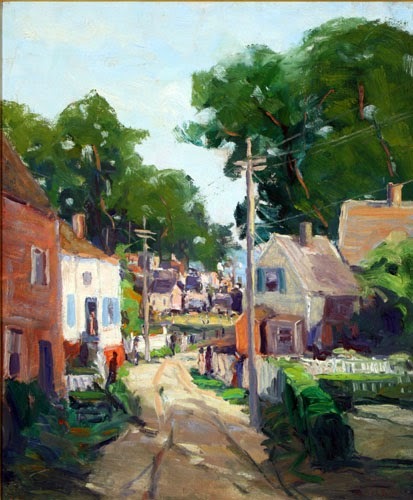 A trip "up along" would take riders into the Portuguese neighborhoods of the West End, and folks bound for the East End would make their way "down along," to the traditionally Yankee neck of the woods. Bradford Street was also served by this assortment of various vehicles throughout the years, collectively known as the "accommodation." With newer models replacing older ones as time went on, and with several companies serving the town over a period of years, these conveyances all seemed to have a few things in common. They were open on the sides, with running boards that passengers would climb to rows of seats, about a half-dozen upholstered benches running the width of the vehicle. There was a canopy overhead, and a sort of curtain all around, which was most often rolled up, but could be lowered in bad weather. The "accommodation" was a motorized buggy, if you will, sans horse, and for the 5¢ one-way fare you could ride the entire length of Commercial Street, or Bradford, with the driver happily stopping here and there along the way for passengers to run their errands. The other patrons waited patiently through these brief delays, because they would often make their own requests for stops along the way. 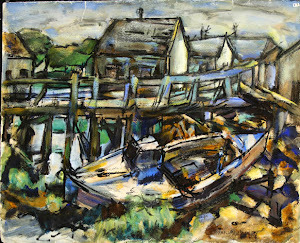 According to author John Hardy Wright, in his book Provincetown: volume II, the vehicle pictured above was dubbed The Pilgrim, among the earlier vehicles of this sort, running on wheels made of hard rubber. Wright suggests that Bill Nickerson may have been the first driver of one of these vehicles, but he also mentions that Josiah L. Young claimed to have been the original "town cabbie." 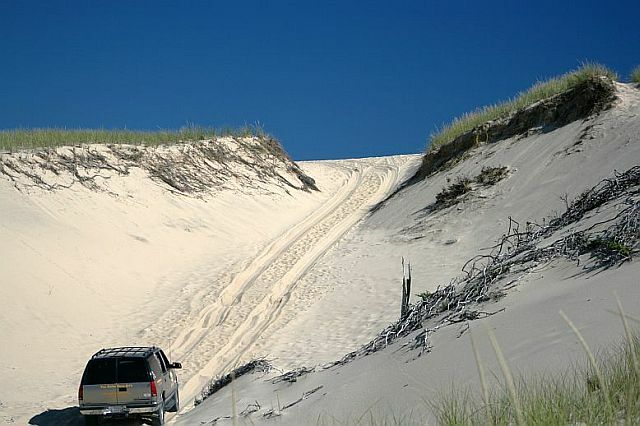 The book also tells of a driver called Mr. Kendrick, who entertained his riders with numerous Cape Cod stories, which no doubt helped to pass the time pleasantly while waiting for a fellow passenger to return to the bus with a pound of bacon from the butcher shop, or a paper from the newsstand.